I Roll NY has teamed up with KuKu? to bring you a new online edit contest. KuKu? is a multi-sport brand based in New York City and I Roll NY has teamed up to offer skaters from all over New York and New Jersey a chance to win some fresh new gear. That’s right! 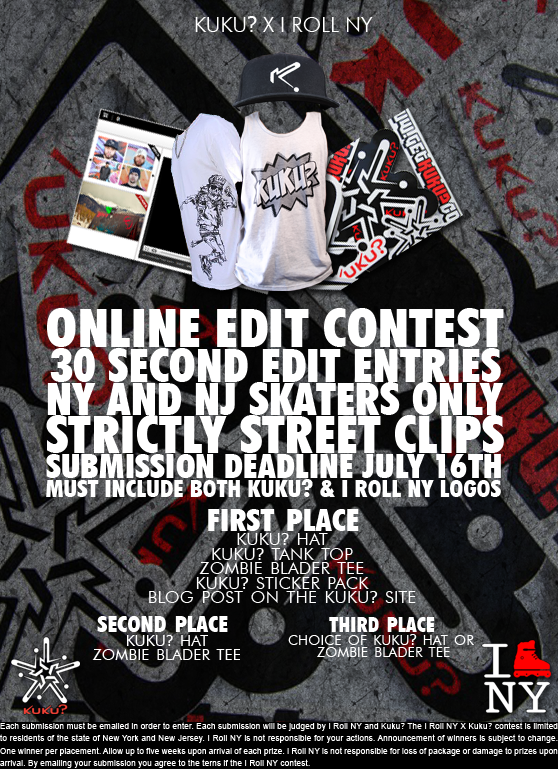 Now New Jersey has a chance to show their skills in this 30 second online edit contest. We’re giving away a bunch of KuKu? gear and an exclusive KuKu? tank top before it’s released to the public! Rules and information on the flyer and below. Start filming! Street skating only! No parks, boxes, or prails. If you upload your submission to youtube please choose a song that won’t be blocked due to copyright issues. We prefer vimeo because they won’t disable the audio if you break any copyright regulations. Anything rocks though. Any edit going over the time limit will not be considered as a finalist in the contest. Download the I Roll NY logo here. Download the KuKu logo here. Right click on each link and choose “save link as” on both links. One winner for each place! Only entries from NY and NJ will be considered in the voting process. Email should include a link to your edit, your full name, and address. No late entries will be considered as finalists in the contest. Tags:Contest, i roll ny, irollny, kuku? The guys over at Scumpire, the blading social networking site, are having an online Battle My Crew format contest. The rules are simple and are listed below. The deadline for an entry submission is June 15th. This contest is a great warm up to the NYC Battle My Crew contest that is said to take place this Summer. Take a look at the video below to see an example of what the empire of scum is looking for and start filming! -To be considered, at the beginning of your edit include a creative plug for SCUMPIRE. -Everyone in the edit must have a registered profile on the ScumLife Tab. -No more than 10 people featured in the edit. -Edit must not be longer than 4 minutes in length. -Judged on entertainment, not solely on skating. Be creative, showcase some lifestyle footage. Have fun. -Originality in filming, editing, acting, etc. -Submit edit to us via VIMEO.COM. Password protected. Posted on the VIDEO tab on the ScumLife Board. –Deadline for submission is JUNE 15, 2010. Xtreme Wheels “Rolling Rumble 5” Contest Today! 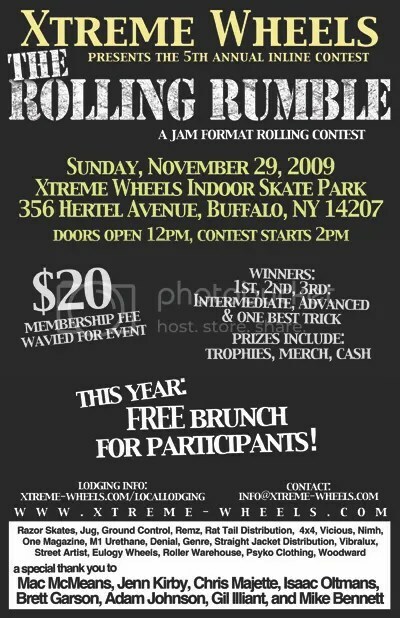 Xtreme Wheels Skatepark in Buffalo, NY will be throwing their 5th annual rollerblading contest today. Make sure you attend the contest as it’s sure to be a great one and changes/updates are being done to the park just in time for the competition. I hope to see some NYC kids there because there will be cash prizes, trophies, and merch to winners in each division along with a best trick prize. Also participants this year will get a free brunch so even if you don’t place you’ll get some free food! All the info is on the flyer above and at Xtreme Wheels site. Xtreme Wheels Skatepark in Buffalo, NY will be throwing their 5th annual rollerblading contest this Sunday. Make sure you attend the contest as it’s sure to be a great one and changes/updates are being done to the park just in time for the competition. There will be cash prizes, trophies, and merch to winners in each division along with a best trick prize. Also participants this year will get a free brunch so even if you don’t place you’ll get some free food! All the info is on the flyer above and written below. Check out all the sponsors because this comp is guaranteed to be big! New this year: FREE Brunch for participants! Next month Art of Rolling Magazine will be hosting an exclusive Stuyvesant rail challenge. The challenge will consist of 10 qualified skaters who dare to test their skills and attempt to clear New York City’s toughest skate spot for a best trick reward of $100. This challenge will not be open to any spectators due to issues that may occur with security. However, the challenge will be filmed and photographed by Art of Rolling Mag, Skeptic Media and Evotek Media. Coverage of this event will be available in Issue 5 of Art of Rolling Magazine and on I Roll NY. The admission date to submit your request will start on July 19, 2009 which will follow a prompt reply by one of our staff members, once we have evaluated that you have fulfilled our requirements. Put this date on your calendar, this event will be first come first serve. Requirements below. The event will be sponsored by Art of Rolling, I Roll NY, Skeptic Media, Evotek media, Wheels In Motion and more. Prizes include $50 to the first skater to clear the rail with any trick, $100 for the best trick, and of course bragging rights. Dre Powell with a sample of the crowd. Sam, Ramelle, MC Rah, Murda, Rob owner of Flatline, Rachard Johnson and Alex Nunez. Today a lot of sick tricks, pro skaters, and new products were revealed at today’s Summer Heat competition in Allerton skatepark in the Bronx, NY. 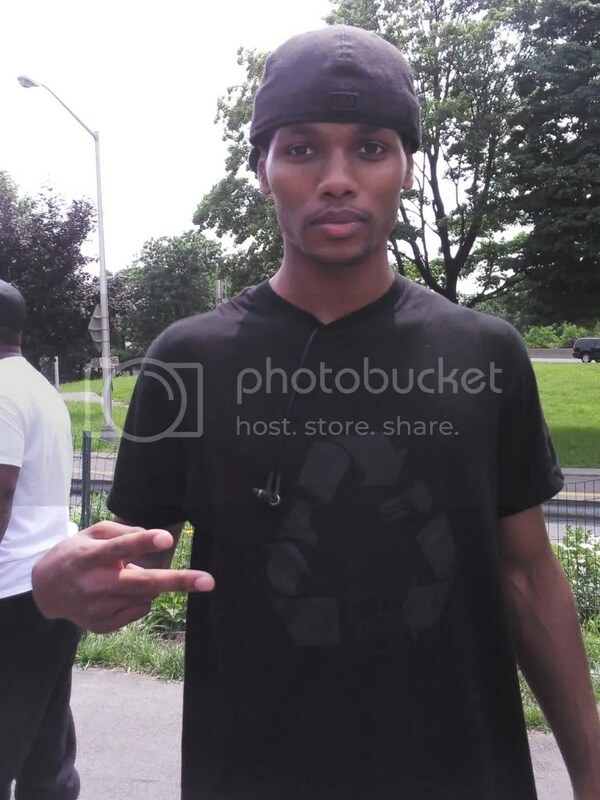 Dre Powell, Mike Johnson, Rachard Johnson along with all the NYC pros came to the Bronx to support Flatline’s efforts. Evan Grimball also premiered his own line of shirts, also seen above. Angelo Ferrer and his wife Layla handed out copies of the Art of Rolling issues 1-4 on CD and on paper as well as taking portraits of almost everyone with skates on their feet. As for I Roll NY we personally handed out stickers to all the attendees and had the new design on an american apparel v-neck shirt. They’ll be available soon. As for the competition Jose Henriques took first place in the Advanced division. A big congratulations to Jose along with PJ who took second place as well as Evan Grimball who took third. Alex Nunez took best trick with a negative acid down the Skeptic Media box. More coverage of the event will be coming soon. If you have any pictures or any edits from today check out our Submit your New page to get yourself featured! 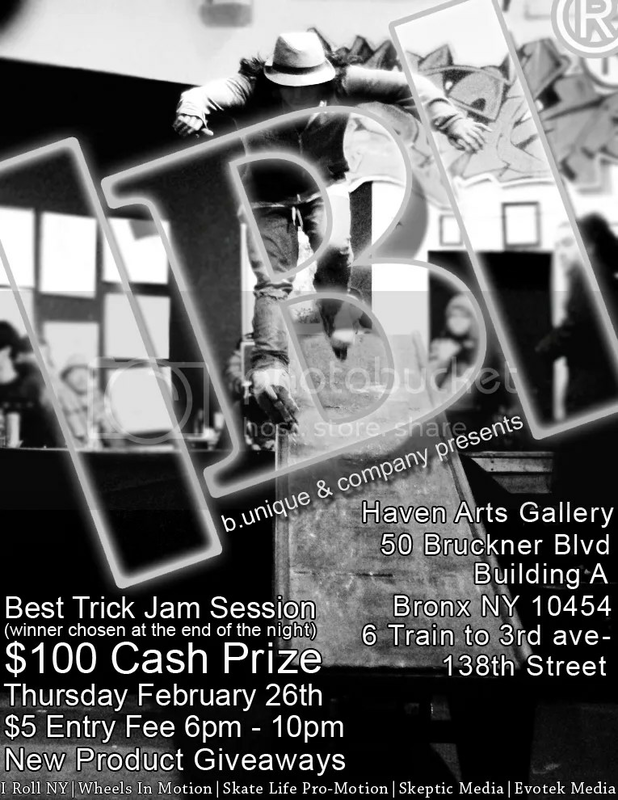 For those who missed out on the Boogie Down Show Down and for those who will not be leaving to attend the Bitter Cold Show Down this weekend, B.Unique and the Haven Arts Gallery are throwing one last final jam session with a $100 prize for best trick. This will not be setup like your average competition. It’s in a jam session format which means all the competitors will session the box through the night and the winner will be announced later in the evening. Besides the jam session, B.Unique will be showing off their new never before seen products for 2009 and may also be giving a few samples out. Mark Carranceja of Noise Maker Media and head filmer for Last Man Standing put up this great edit from last year’s series of LMS competitions. The edit features Julian Bah, Robert Guerrero and a mass amount of NYC rollers. See if you spot yourself in the crowd. “Last Man Standing NYC Unofficial Edit / Filmed by Mark Carranceja (Noisemaker Media), Christen Cofer (EvoTek Media), Navin Hardyal (Skeptic Media), Ray Mendez, Suren, and Justin Denamrk / noisemakermedia.com / skepticmedia.com / evotek.tv” -Noise Maker Media.